What drew you towards tattooing? The first thing that drew me towards tattoos was just how cool they looked. When I was younger I didn’t really see the difference in quality between tattoos I just thought they looked awesome. Once I got a bit older I started to see the power behind the symbols that people had on them and also for me it looked like armour. I think the whole mystery and at the time underground aspect of tattooing resonated with me. It took me a long time to get my first tattoo but once I got my first I started to see them in a different light again. One thing that was a big draw for me was the concealing aspect that tattoos have. For me they allowed you to take control of what your body looked like and at the same time hide parts of yourself that you maybe didn’t want people to see. I decided to take the jump and get my first tattoo shortly after my 21st birthday. I woke up after the party and realised I hadn’t done half the things I wanted to do. I also had body issues at the time and so saw it as a way to control what I looked like and therefore improve my own self image. I’d messed around with a few ideas for tattoos before and ended up making a semi thought out decision and got the Greek alphabet around the top of my left arm because we use it a lot in science. I didn’t really do any research and ended up walking into a Hells Angels shop. The artist there, Jean-Paul, sat me down after a quick discussion and started. It was a good experience and was how I think a first tattoo experience should be. It was frightening and exciting at the same time whilst still being fun. After that I was hooked. Could you tell me more about the story behind Frith Street ? I first discovered Frith Street completely by accident. My friend had booked a consultation there and I decided to go along with him. I looked through a couple of the portfolios and left thinking it was a cool shop and then didn’t do anything for a few months. My friend started getting tattooed by Stewart Robson and once I saw how good his tattoos were I decided to book in to have a ship and octopus done on the outside of my right arm. I got the linework done just before I went travelling around India, China and Thailand and whilst out there got a lot of compliments on it even though it was just lines. Once I got back from my travels we did the colour for the piece in one 6 hour session which was really cool. I booked in straight away to have something done on the inside of my arm and also on my chest. I haven’t stopped being tattooed at Frith Street since. Since being tattooed by Stewart I’ve also been lucky enough to be tattooed by Valerie Vargas, Todd Noble, Brad Fink, Chad Koeplinger, Seth Cifferi, Frank Carter, Jordan Teear and Steve Boltz at the shop. They also introduced me to a number of different artists and I managed to get tattooed by Greg Christian, Nick Rodin and Cody Miller at the Paris Tattoo Convention this year as well as by Stewart and Valerie. Stewart Robson has done most of your tattoos so far. What particularly drew you towards his work? Stewart Robson has so far done my upper right arm, my entire front torso, my back piece, both of my knees and the side of my right thigh. I have a lot of trust in Stewart and think his artwork is incredible. For all of my tattoos I haven’t brought in a single piece of reference, instead I’ve given him an idea and he’s nailed it every time. I always enjoy getting tattooed by Stewart as we normally have a lot to talk about including my research work which he jokes is attempting to create the terminators (laughter). I picked Stewart to do the majority of my tattoos because I’d seen how versatile he was and the passion he showed not only to tattooing in general but in making sure every design he did was perfect. It was something I could relate to as I try do the same with my own work. We have a very similar sense of humour and he has influenced a lot of my views and perceptions of tattooing. For me one of the most important things is earning visible tattoos such as your hands and neck. I doubt I will get my lower arms, hands or neck tattooed but it’s something that me and Stewart talk about a lot. 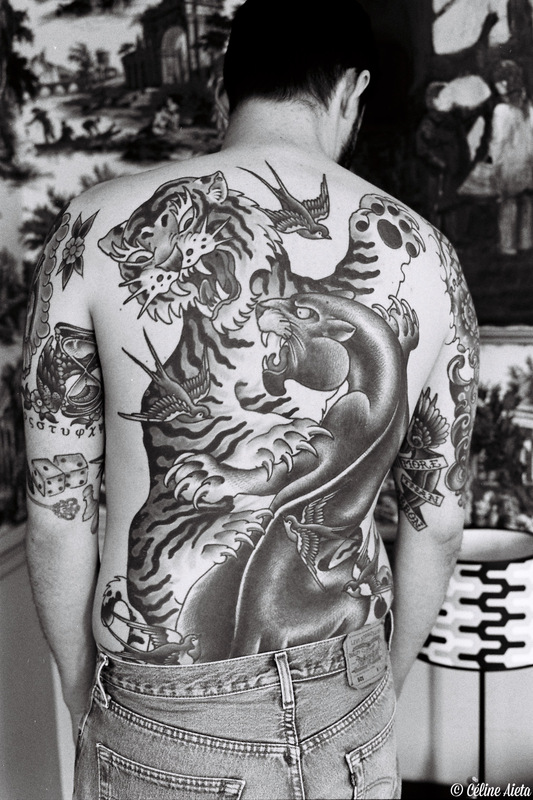 I’ve also been incredibly lucky to help him with one of his documentary projects “FST: On The Shoulders Of Giants” which has given me even more insight into the world of Frith Street and what goes on other than tattooing. I’ve also learnt a lot about the personalities of the tattooers he interviewed, even to the point where listening to one of the artists’ interviews made me want to get tattooed by them, which I did. I got to hear some of the history of Frith Street (which I’m sure you will see in the film) and also how hard they all work and how much they’ve sacrificed to be where they are. I’m very grateful for the tattoos that Stewart and everyone else at Frith Street have done on me and feel very lucky to be able to get tattooed at Frith Street as much as I do. I found the idea of earning visible tattoos quite interesting, could you tell me more about it? For me I don’t think visible tattoos are for everyone. Due to my work I can’t really have visible tattoos and so I put the constraint on myself that I won’t get my lower arms, hands, neck or face tattooed. I think I will eventually get my lower arms and hands tattooed but not until the rest of my body is completely covered and I’m in a safe position to do so. I always remember what a tattooer told me “People don’t need visible tattoos” and I agree with it completely. For me visible work is something that I want to earn by having all the difficult spots done first. I see lower arms, hands and neck as places you do as a reward for having gone through everything else. I don’t have a problem with people having visible tattoos but I very much think the old tattooers were right, no hands or necks unless it’s the only space left. What is your inspiration when it comes to tattoos? And what do you particularly like about traditional style? I get inspiration from all around me for my tattoos. I like a lot of traditional imagery but I also tend to look at a lot of work from different tattooers. I have tattoos which are just flash straight from a sheet and I’ve also got tattoos which I thought about more. I don’t necessarily look in any specific location for tattoo inspiration but if I see an image that resonates with me then it’s something I’ll consider for a tattoo. I really like the bold and clear aspect of traditional tattoos. For me they look like tattoos and will continue to look like tattoos after 40 or 50 years. I also love how powerful they can look from a distance and that although they look simple to draw, they require a lot of effort to really pull them off. I do like other styles of tattoos and the more I see of different style the more I realize how each tattoo style has its own power. I’m starting to really love traditional Japanese work as well and I’m hoping to get some more. How did you consider getting a full body suit? I never really considered getting a full bodysuit. I still don’t think I’m that heavily tattooed. I think once I saw how incredible colour tattoos could look after getting tattooed by Stewart I just kept on adding pieces. Once I had my chest done my stomach looked empty so I got that done. Once my front was done my back looked empty and so I decided to get that done as well. Then it just moved down to the legs and feet. It’s funny because for me I don’t see my tattoos; I tend to just see the empty skin between them. Could you emphase on the idea of power and magic in tattoos? The magical aspects of tattoos for me kind of come from the history you see of a lot of the tribes who got tattoos for different reasons. As well I think every tattoo, no matter how bad it’s done can hold some power for the person that wears it. It’s what I like about traditional tattoos. They have a lot of power in them, not just the image but the way they sit and move on the body. They can kind of acts like talismans and it’s something I love about tattoos in general. They are ancient and they have and always will hold a lot of power. What has being tattooed changed for you? Did tattoos change the vision you had of your own body? The major change that I had once I’d been tattooed was a huge confidence boost. They changed the way I saw my body massively. They gave me a lot more confidence and made me a lot happier in my own skin. Before I never looked at myself in the mirror, even to just brush my teeth. Now I’m a lot happier and feel more confident as a person. I also feel more attractive which might not be the case but as long as I feel it I’m happy. Getting tattooed also introduced me to a whole new world of experiences and people that I wouldn’t have really known about before. It’s also forced me to do things which I may have been too shy to do before because people come up and ask about my tattoos, especially in Asia. There have been a few bad aspects like people looking at me in horror on public transport if I wear shorts but I think it’s a small price to pay for having my tattoos. I don’t show my tattoos a lot unless I’m with friends. Overall they’ve made me a more positive and more confident person. I get told a lot that I don’t look like someone who has tattoos. I think this is a good thing as it means I’m not continually judged on my tattoos even though they are now a huge part of who I am. Having tattoos has also forced me to have interactions I might not have otherwise had. They’ve also allowed me to be involved in the awesome world of tattooing, so I’m very grateful. How would you explain the addictive nature of this art? I think I used to feel a real need to get tattooed but now it’s not so much a need as a desire. I know that I’ve had a lot of work done in a fairly short space of time and I guess getting tattooed is addictive. I think for some people once they realize how much control they can have over their own body image it can become an obsession. Being tattooed is not always a fun process but the result for me has always been excellent. As well, the more I get tattooed the more I want to be tattooed. I feel I’m getting closer to a full bodysuit which for me is something I’ve wanted achieve for a long time. I just hope that once I do have a bodysuit I’ll be happy to stop getting tattooed. What role does pain play in the creative process? I think the pain of being tattooed is partly what makes it worth it. Not only do you have an image that will be with you for the rest of your life, you know that you managed to endure however many hours of pain to get it done. How come you’re not frightened about the irreversible aspect? Before I started getting tattooed I was a little frightened by the permanence of tattoos and I thought that each one had to have a very special meaning and be really thought out. Once I got my first tattoo I realised that although it’s a big commitment and I may regret it, I should just worry about enjoying the present. Since getting my first tattoo I’ve thought less about the meaning behind them and more about the image. If I like an image and want to get it tattooed I don’t have to find a meaning behind it, I just go and get it done. That’s not to say that I don’t think about what I want to get tattooed but for me it doesn’t matter that it’s permanent. I love the fact that my tattoos will be with me until I die. I have some bad tattoos but I don’t regret them, I thought they were good at the time and now remind me of those times. How did your relatives react when you started being heavily tattooed? My parents reaction when they saw all of my tattoos was mixed. I don’t think they were shocked because they’d seen that I already had tattoos. I remember them saying they thought the images looked amazing, they just wished they weren’t on my skin. They’re fine with them now although I think they still can’t believe how many I have. 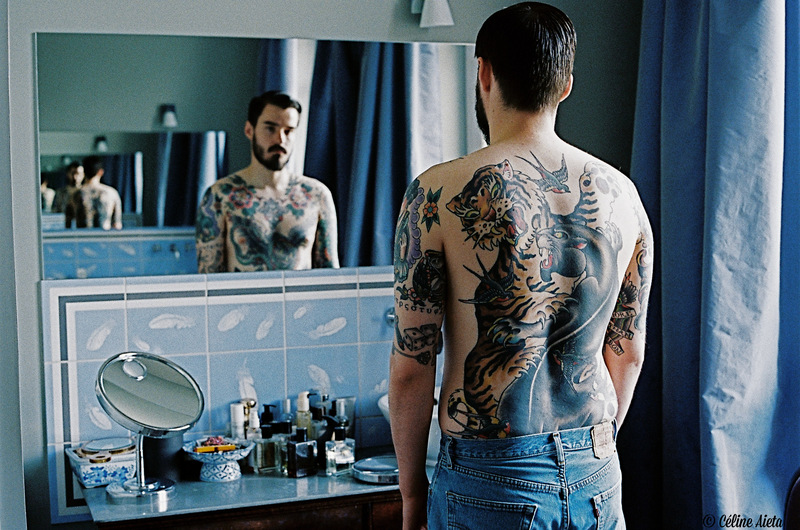 How do you imagine aging with your tattoos? I haven’t really thought about aging with my tattoos. I take good care of them and always use the highest factor sun block I can buy. None of my tattoos have fine lines or too much detail so I think they’ll hold up pretty well. The tattoos I got five years ago still look the same as they did when I first got them. I think the fact that I have fairly pale skin also helps them to look bright. I have no regrets at all when it comes to tattoos. I personally don’t believe in cover ups and think even if there’s a tattoo you don’t like, eventually you’ll live with it long enough that you’ll accept it and maybe even come to like it. Could you recommend a few books on tattooing? My biggest dream would be to win a Nobel prize in Chemistry and raise a family. For the moment I’m just happy to have people around me that love and support me and I’m very thankful for everything they do for me.